Introduction. The anatomy of the gastric bypass poses difficulties for the surgeon in evaluating and treating gastric bypass patients with upper gastrointestinal tract and biliary diseases. Gallbladder disease is significantly increased in the morbid obese patient and also in patients who lose weight at a rapid rate. There are several methods that have been described to evaluate and treat biliary disease in these patients. They include gastrostomy tube placement for ERCP, common bile duct exploration with stone extraction and sphincterotomy, as well at laparoscopic assisted ERCP. Biliary disease is well known entity and is often described in the gastric bypass patient. Biliary disease, however, is not the only disease entity that is difficult to evaluate and treat in the gastric bypass patient. In this paper, we use two cases to show how laparoscopic transgastric access to the bypassed stomach allows for evaluation and treatment of not only the biliary tree, but it also allows evaluation of the bypassed stomach and duodenum. Methods. 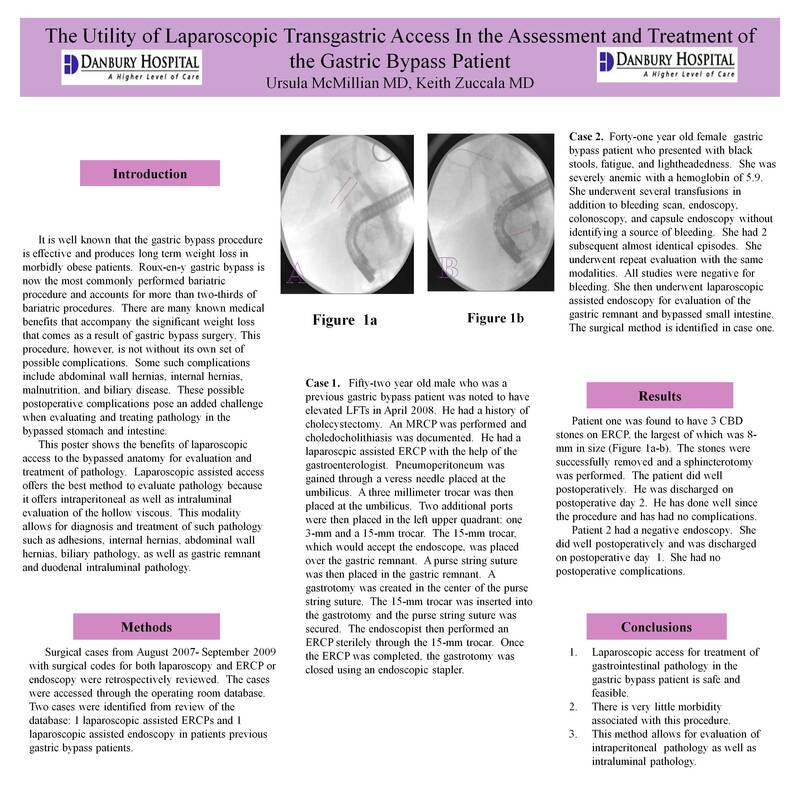 Chart review was performed for patients status post gastric bypass that had undergone laparoscopic transgastric access from August 2007 through September 2009. We found that two patients had undergone laparoscopic access to the gastric remnant: one for ERCP and one for gastroduodenoscopy. A gastrotomy was laparoscopically created in the gastric remnant. A 15 mm port was placed and secured into the remnant. The gastroscope was then placed through the 15 mm port for evaluation and treatment of the biliary tree and the bypassed upper gastrointestinal tract. The gastrotomy was stapled closed following each procedure. The patients were kept overnight in the hospital and discharged home the following day. Results. One patient was found to have 3 common bile duct stones that were successfully removed via laparoscopic ERCP and sphincterotomy. The other patient was being evaluated for upper gastrointestinal bleed. The bypass stomach, duodenum, jejunum were able to be thoroughly evaluated although no source of GI bleed was found. Conclusion. Laparoscopic transgastric access to the bypass anatomy in the gastric bypass patient is feasible and effective for evaluation and treatment of the biliary tree and bypassed upper gastrointestinal tract. The procedure is also associated with very little morbidity.